The taste of this snus is very natural, imagine pure tobacco taste with a hint of something sweet and smoky. The taste is very clean – just like with the Rothbrix White Portion – and it just tastes.. Natural and clean. I like this one a lot! The flavor stays strong from the moment you put it in until you take it out without being overwhelming, which I also thought was a plus. The smell is actually very similar to the smell of Ettan White Portion (which I love by the way), but this smell is not as harsh and strong. It’s a bit more soft and smooth but still has that clean tobacco aroma. The pouch is exactly like the ones in Ettan white portion, neatly organized and placed in that neat little swirl pattern.. I don’t know why but it makes me happy every time I see that. Compared to for example the Rothbrix pouches they’re not as soft but still soft enough to lay pleasantly in your mouth and the pouches look very white and clean which adds to the overall feeling of freshness. With 11mg/g of nicotine the strength of this is just perfect – it is stronger than for example the Rothbrix White Portions (8mg/g) and weaker than the Oden’s Extra Stark (17 mg/g, which was too strong for me). These ones give you a nice buzz without making you dizzy or making you feel overwhelmed. This one feels good under your lip, the size is perfect and you can barely tell that it is there. 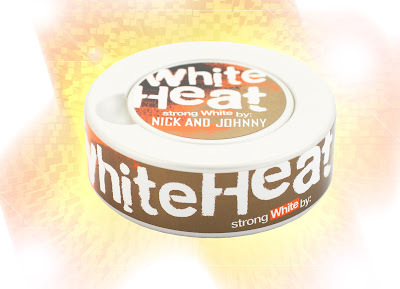 It has a tiny bit of a burn, especially if you place it somewhere in your mouth where you normally don’t place snus. It is a tiny bit moist for a white portion but not in a bad way, it’s just enough to make sure it doesn’t get stuck to your gum and breaks! For those of you that have tried the Camel Snus with candy flavor – you know what I’m talking about.. The can I have in my possession is white/silver-ish looking which I absolutely love – it goes perfect with the clean taste of this snus. It doesn’t feel as flimsy as some cans (like the Rothbrix can). As far as the label itself I love it! It feels like they really made an effort to make it a bit more youthful (than for example Ettan who looks like it’s being marketed for 80 year old men) with the font and the colors of the can. I love it, it is different and someone clearly made an effort! I could pull up this can at an art show even and people would be curious just because it looks cool. I would definitely buy this one again, no doubt about it. The combination of a slightly higher nicotine content than my old favorite Ettan White is perfect, the can looks great and is good quality and the flavor of the pouches is familiar yet new. Definitely one of my new favorites!